Choose good quality bed sheets as you are going to spend time on it! Traditionally, chinese bridal bed sheets were red or pink embroidered with dragon and phoenix in gold threads, or with flowers such as peony or magnolias. Due to western influence, modern young chinese prefer modern designs in softer color such as pink, cream or lavender. Mourning colors such as black, blue, grey should be avoided for bridal bed. Chrysanthemums are avoided as they are used for chinese funerals. The designs chosen should be joyful and pleasant. Flowers or heart shapes, either printed or embroidered are suitable. Lace adds to the romantic quotient. And if your budget allows, you can always go for 100% combed Egyptian cotton! Except for children who are thought to bless the couple with fertility, no other adult should sit or rest on the bridal bed after its installation and before the chinese wedding. It is also taboo for the bride to lie on the bridal bed before the chinese wedding. It is believed that this will lead to her poor health. If the groom has to sleep on the installed bridal bed before the chinese wedding, he should be accompanied by a young boy. It is considered extremely unlucky to leave one side of the bed empty while the groom sleeps on the other side. The Taiwan chinese has a saying; [睏空舖，不死尪，亦死某] which means leaving one side of the bed empty is to curse death on either half of the new couple. When to install the bridal bed? Some chinese believe that it is important to choose an auspicious date and time to install the bridal bed, as a new branch of the family is starting on it! As most prefer not to disturb the bed after it has been “installed”, the auspicious date chosen is usually during the week before the chinese wedding. Who to install the bridal bed? A good fortune woman, one whose husband and children are all alive and has grandchildren, may install the bridal bed. How to install the bridal bed? The bridal bed is moved slightly to symbolize its installation. The good fortune woman will make the bed with the new set of bridal bed linen. 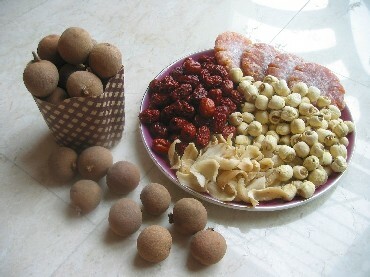 The dried longans, dried red dates and dried persimmons are sweet and will bless the marriage with sweetness. Pak hup [百合] stands for [百年好合], hundred years of harmony in the marriage. The lotus seeds [莲子] and pomegranate [番石榴/红花] leaves bless the union with fertility. Chinese also believe that pomegranate leaves have the power to ward off evil. 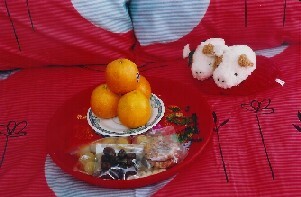 The oranges and red packets are for good fortune. Don’t forget the bedside lamps. She will then light a pair of bedside lamps. In chinese, lamp [灯 “deng”] has the similar sound as son [丁 “ding”]. So lighting the lamps, [添灯] is symbolic of adding sons [添丁] to the family. These lamps are not to be turned off until wedding night. If they are batteries operated, it is not necessary to replace the batteries when they run out, even before wedding night. 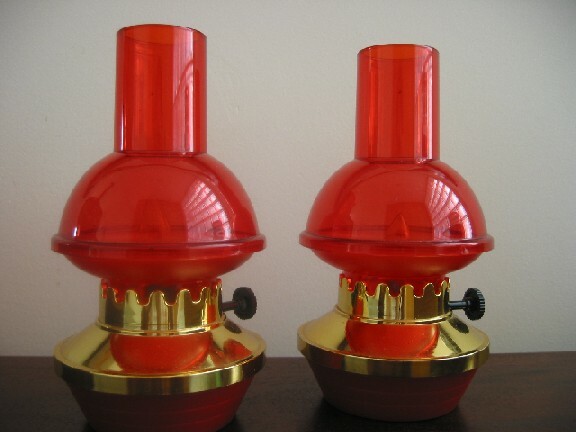 For this purpose, bridal supply shops in Singapore usually carry small batteries operated lamp styled after kerosene-oil lamp used during 1960s-1970s. See picture above. If these clashes with your bridal room decor, any other type of lamps are suitable, crystal, glass, paper, etc. err...the lava lamps do seem a bit weird. But what a good time to check out those cute cartoon character lamps such as Hello Kitty’s or Sanrio’s Little Twin Stars bedside lamps! Immediately after installing the bridal bed or on the wedding day, little children are invited to roll on the bed to bless the couple with fertility. To encourage them to get on the bed, they are allowed to eat the sweet stuff on that plate the good fortune woman has left on the bed. This is referred to as [压床] ”ya chuang” or [翻床] “fan chuang”. Remember to give red packets to the good fortune woman and children for their help. Someone told you something about chickens under the bridal bed? Yes, in the past, but not anymore unless you are from some rural communities that still keeps live chicken in backyards. During the bride’s home visit in the past, at least a pair of live chickens was brought as gifts to the bride’s parents. The bride’s parent’s return gifts to the groom will also include a pair of live chicken to “lead the way” back [带路鸡]. When the couple returned from the bride’s home visit, the chickens were released under the bridal bed. That’s why grains or beans were included on the plate left on the bridal bed or scattered under the bed in some chinese communities. The chickens will scamper under the bed, eager for the snack. It was believed that the firstborn will be a boy if the rooster came out from under the bed first.